The vast majority of folks run a Segmentation system. 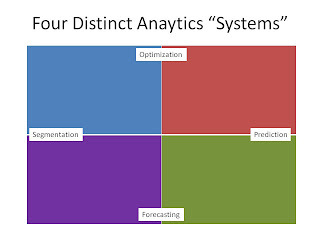 Segmentation systems are, in large part, responsible for the analytics mess we're in today. And yet, Segmentation systems are very effective, enabling us to make decisions that help our businesses grow. Segmentation systems are popular because they are easy to implement. Take Google Analytics ... it takes you all of a few minutes to put Google Analytics on your website, it costs nothing, and you're almost instantly obtaining actionable feedback. Be aware that there are forces in your company that are not supportive of your Segmentation system. Because Segmentation systems are easy to implement, folks prefer their own Segmentation system over your Segmentation system. The bigger the company is, the greater the likelihood that somebody is crafting their own Segmentation system in opposition to your work. I go back to Nordstrom. My team essentially ran a Segmentation/Forecasting hybrid system. This system was in contrast to many other teams. When a business issue came up, at least six different teams tried to obtain answers, using their own systems. The Web Analytics team presented one-channel findings via Coremetrics. The Credit team presented credit-centric customer findings via their database, a database that you weren't allowed access to. The IT team had analysts that ran ad-hoc queries using SQL against the customer data warehouse, providing their own analytical viewpoint. The E-Mail marketing team provided their results, based on data from CheetahMail, results that spoke to the performance of e-mail marketing campaigns. Merchants used merchandising systems to report on the performance of their products. My team ran our analytics against the customer data warehouse, trying to cobble together a story of customer behavior across all channels (a "Multichannel Segmentation System, if you will). Who was right? Everybody, of course. And nobody, of course. You could only believe part of the story the Web Analytics team told, but their story was only valid for 10% of the business. You could believe part of what the Credit team shared, but it was valid for 20% of the business. You could believe some of what the IT team suggested, as long as the IT team audited their own queries properly. You could believe some of what the e-mail marketing team said, but their results were only valid for 3% of the business. You could believe some of what the merchants said, because their systems tied out to Finance, so that gave them some credibility. 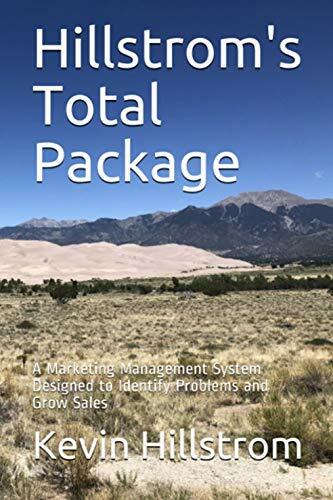 And you could only believe some of what my team said, because we weren't responsible for any marketing activities, so our results, while unbiased, were not accepted because we didn't reside in various marketing silos. Now, an outsider might look at this and say, "... whoa, why not just come up with one version of truth, you have a multi-channel customer database, just have Kevin's team share the results and that's it, nobody else works on the problem ... this is the problem with a silo-based approach to marketing and analytics." The problem is that Segmentation systems are easy to implement, so no matter what you do, it is human nature for folks to seek their own version of truth. And trust me, folks will seek their own version of truth. If you are going to rely upon a Segmentation system in your company, you better be ready for competition. There will always be somebody out there who thinks they can do a better job than you can do ... that person is likely to reside in the IT department ... that person is likely to reside in a different business unit ... heck, I've even observed that person rising out of the finance department! And you better be ready to be wrong. 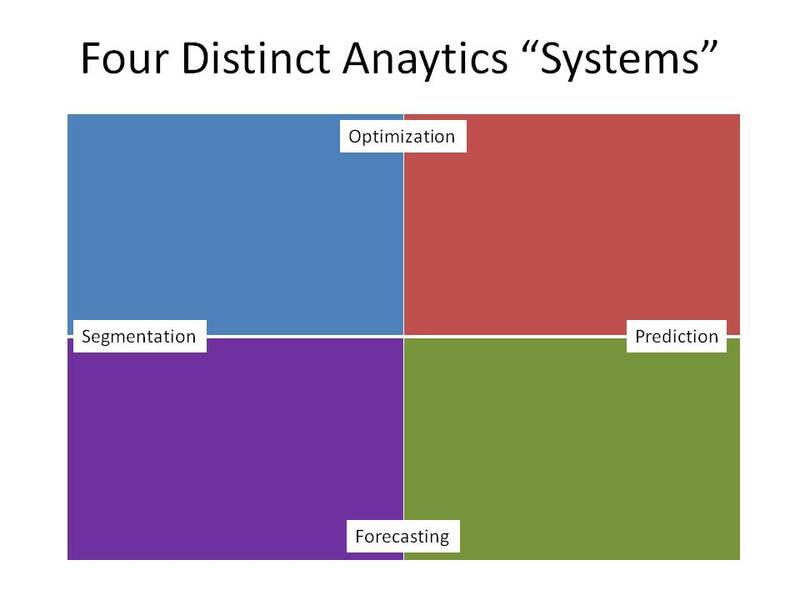 The problem with running a Segmentation system that is easy to use is that folks in the Optimization camp, the Prediction camp, and the Forecasting camp all are ready to use advanced analytics to demonstrate that your data is "wrong". You'll run a query that shows that "multichannel customers are the best customers", and somebody like me, running a Forecasting system, will blow your hypothesis out of the water. Oh boy. If you're going to run a Segmentation system, you almost have to focus your efforts on one word ... "profit". Always be the person who knows how profitable every activity is/was. The majority of your co-workers, folks running rogue Segmentation systems, are not going to go to the effort to calculate profit. Profit gives you an advantage over everybody else, in fact, you instantly gain a valuable ally ... the finance department!! Interesting read.. it's problems like this (coming up with one version of truth) that we try to solve with Bime (the SaaS BI and Analytics tool). When each team has a different way of looking at data, and a different way of interpreting it, this can make it difficult to reach a consensus...with Bime you can connect to all your different data sources at the same time so you get a good overview of your business activity, instead of a biased one from a single team. for example, you can put your google analytics data right next to your financial data and see the correlations.